Lord Rangji is believed to be an incarnation of Lord Vishnu. There are two temples dedicated to Lord Rangji. The old temple was built by Seth Puran Mal Ganeriwal of Hyderabad in 1823. 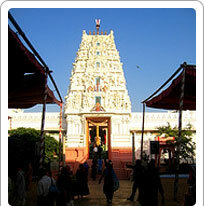 The temple is also known as Shri Vaikunt Nath. Quite distinct from the other buildings of this period, this temple has the influence Sounth India (Dravidian) style of architecture along with the Rajput and Mughal styles that are a more common sight in Rajasthan. The new temple has a tall Gopuram that is typical of temples found in South India.